Etihad Guest members now need more miles to upgrade to business class and first class with Etihad Airways, and to book flights outright using miles under the latest changes to the airline’s frequent flyer scheme. However, it’s not all bad news: some upgrades remain at the previous, more generous rates, while those that are increasing are mostly nudging north by a palatable 5-10%. Wherever you’re headed, here’s what you need to know. As before, the number of miles needed for a business class or first upgrade depends on where you’re flying and the type of ticket you originally paid for. On journeys between Sydney and Abu Dhabi, Economy Flex fares now require 48,600 miles for a one-way upgrade to business class – up from 45,599 miles previously – while midrange ‘Economy’ fares remain at 68,399 miles and Economy Saver tickets stay at 91,198 miles for the same upgrade. Upgrades from business class to first class are also unchanged at 68,399 miles on this route. Longer treks such as Sydney to London see increases across the board, with a one-way business class upgrade now costing 78,600 miles on Economy Flex tickets (previously 73,553 miles), and 107,399 miles from branded ‘Economy’ fares: up from 103,342 miles before. Economy Saver tickets also climb from 143,612 to 148,698 miles for the same upgrade, with business class passengers impacted as well, with the asking price for a first class upgrade now 107,399 miles, compared to 103,342 miles previously. Upgrading only the Abu Dhabi to London leg of a journey to first class also comes with a higher points cost attached, now being 39,000 miles instead of 34,943 miles as before, although the number of miles needed to upgrade from business class to first class between Melbourne and Abu Dhabi remains unchanged. As before, only business class passengers can upgrade to first class, which means economy travellers can only upgrade to business class. Upgrades from Business Saver and Economy Breaking Deals fares remain unavailable. To see how many miles you’ll need for an upgrade on your next Etihad flight, use the airline’s newly-revamped mileage calculator, and select the “show me how many miles I need to upgrade” option. Similar changes have also taken effect when using your hard-earned Etihad Guest miles to book an Etihad Airways flight outright in your preferred class of service. For example, a one-way first class ticket from Sydney to Abu Dhabi now costs 136,249 miles, up from 130,216 miles before. Jetting through from Sydney to London now pegs a first class seat at 223,999 miles – previously 216,513 miles – and a business class ticket at 162,500 miles: a minor decrease over 162,792 miles previously. As always, the precise number of miles needed depends on your exact route, rather than using region-based ‘zones’ as with other popular frequent flyer schemes. A one-way business class flight from Melbourne to Paris is now a precise 162,501 miles, as opposed to 156,367 miles before, but there’s a bigger bump for Perth-based flyers travelling to New York via Abu Dhabi, with the previous asking price of 179,062 miles jumping to 190,001 miles in business class. In addition to showing upgrade costs, Etihad’s mileage calculator can also highlight how many miles you need to book flights on any other route – just choose the “show me how many miles I need to fly” option. Virgin Australia’s Velocity Frequent Flyer members can continue booking Etihad Airways flights using Velocity points at the usual rates, although fees of up to US$300 per flight segment – up to US$1,200 (A$1,513) per return trip to Europe – continue to apply, over and above the other amounts payable in government taxes and fees. Paying more miles now, for cut after cut after ... makes so much sense (not). How about Etihad focus on their own passenger experience & getting people onto their planes, instead of cost cutting with no end in sight! You could not put it better. We recently flew with them in Business after paying full rack rate and it was disappointing beyond belief. It's basically slightly better than Economy service, but in Business class seat with far less amenities. If you want Business class service you need to pay for First Class fare. What a joke. They were always my preferred carrier to fly with, but I think we'll need to switch over to Qatar/Qantas and see how that goes. When is Etihad going to stop with all this nonsense?!?! Instead of changing miles I think they need to release less award seats and focus on paid tickets. I just paid $5,000 for a return Business class ticket from Brisbane to Paris on EVA Air (a very decent Business product) whereas Etihad would have cost over $10,000 for the same dates and route (with very few additional features/benefits compared to EVA). If they want to charge over double then they need to offer a superior business class product. As a data point both Qantas and Emirates were also around this $10,000 price point. This is another worrying sign for Etihad. It also gives concern that one of Virgin's key backers is in such a poor position after having so many failed investments. Etihad are dreaming if passengers are going to put up with all this. They will vote with their feet. They have to take a hit in profits for a while whilst building customers, then the profits will come. They are just going to lose customers. Regarding VA, I dunno why anyone would fly Etihad when you can fly SQ. "Longer treks such as Sydney to London see increases across the board, with a one-way business class upgrade now costing 78,600 miles on Economy Flex tickets (previously 73,553 miles), and 107,399 miles from branded ‘Economy’ fares: up from 103,342 miles before." There in trouble and trying to keep their heads above water - we can all see it. It is a shame there management can't see the long term damage to their brand. I know their marketing teams have no doubt done their homework, but it does not seem to make sense. They will just continue on cutting corners and then look back when their premium product is empty and no doubt ask themselves the naïve question - How did this happen! - when all they are attracting are the discount Y passenger loads, just before they file for bankruptcy. 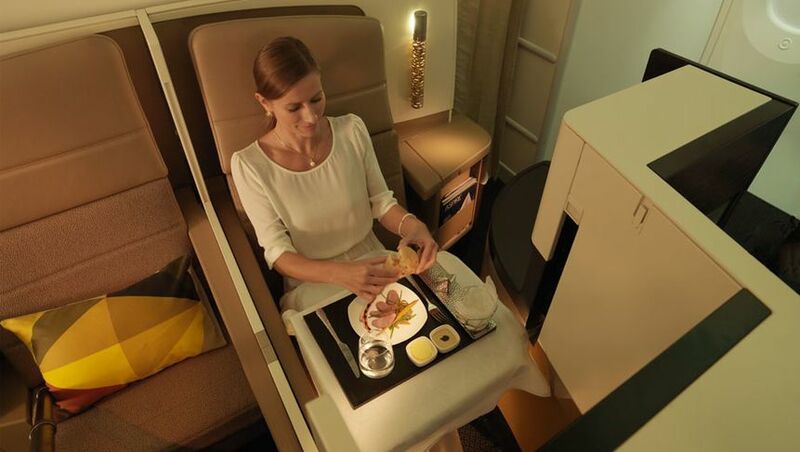 Comment on "Etihad bumps up frequent flyer upgrades, reward flight rates"